​Sclerotherapy is a technique for damaging a vein by injecting it with a chemical. Most commonly used agents act directly on the inner layer of the vein, the endothelium. After damaging the endothelium, a thrombus forms, leading to closure of the vein. The vein then scars over the next 2-3 months. The detergent agents sodium tetradecyl sulfate (Sotradecol) and polidocanol (Asclera) are the most popular because of their power, safety, and ability to be converted to a foam, when mixed with air or carbon dioxide gas. With increasing vein size, larger doses and higher concentrations of sclerosant are required. Because a liquid sclerosant becomes diluted and neutralized by proteins in the blood, it becomes ineffective after traveling a short distance, especially in larger veins. Foam sclerosants are more effective in larger veins because they displace the blood, allowing longer contact time with the endothelium. The interface between the gas bubbles and liquid droplets demonstrate a higher effective concentration and power of a foam sclerosant. Finally, the gas bubbles are visible with ultrasound, enabling one to confirm that sclerosant is being delivered to the inside of the vein and to follow it as it moves through the vein. ​Hypertonic saline solutions are rarely used today because they are associated with a higher incidence of deep venous thrombosis and pulmonary embolism. They too often produce skin ulcerations and they are more painful than the detergent agents. Liquid sclerosants are injected into spider veins and feeding reticular veins, although larger reticular veins occasionally require the use of foam. 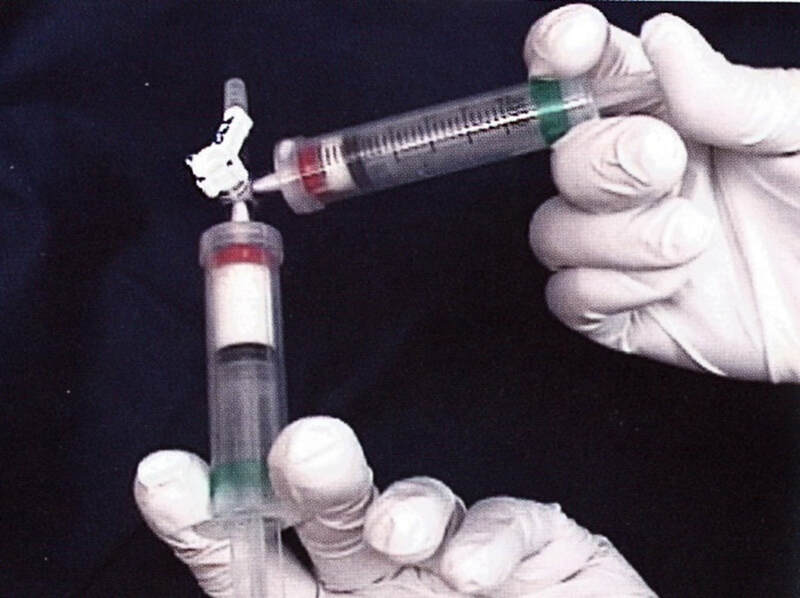 The liquid sclerosants can be mixed in a lidocaine solution, and injected using a very small 32-gauge needle, making the treatments more comfortable. Compression following a sclerotherapy treatment facilitates clearance of blood and sclerosant from a vessel and reduces staining of the skin. Compression stockings are worn continuously for 3 days and, if tolerated, the patient is encouraged to wear them during the day for up to an additional week. Responsiveness to treatment varies. We project a 50% improvement with one treatment, but better results are common. Approximately 80% of our patients are satisfied with the results of a single treatment to a given area. An occasional poor response to treatment necessitates searching for unsuspected sources of reflux, such as incompetent perforating veins and unrecognized or unsuccessfully treated reticular veins. All patients return in one month for evaluation of results and drainage of “trapped” blood that has backed up into reticular veins. At one month, the clotted blood has liquefied and can be drained through small needle holes. Only 10% of our patients require drainage of trapped blood. However, failure to evacuate trapped blood can lead to permanent staining of the skin. At one month, it is possible to retreat an area of spider and reticular veins. Injection of reticular veins under transillumination. ​Adverse results associated with liquid sclerotherapy include skin reactions at the injection sites, “telangiectatic matting” (the appearance of new clusters of fine spider veins), and skin pigmentation/staining. Skin ulcers are rarely seen with the detergent sclerosant used at the proper concentrations. Allergic reactions with sodium tetradecyl sulfate occur in about 0.3% of patients. Foam sclerosants are used to treat larger veins, incompetent perforating veins, and dilated veins deep to a skin ulceration. Patients with a history of migraine headaches with aura are suspected of having a heart defect called a patent foramen ovale (PFO) with a right to left shunt. This defect is present in approximately 30% of the population. 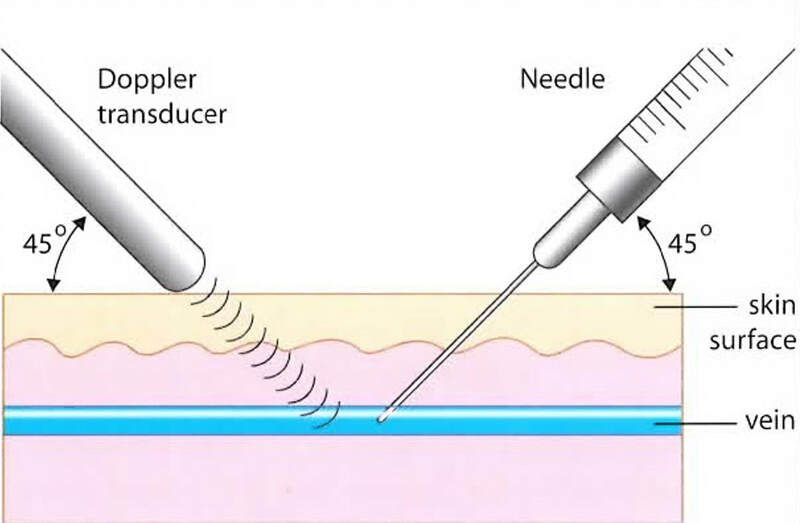 Detection involves injecting a small quantity of air into a peripheral vein and following the course of the bubbles with ultrasound. If they pass from the right atrium of the heart into the left atrium, they will then travel to the head and body. When the bubbles reach the cerebral circulation, they can trigger a migraine. There are also a few reports of strokes following foam sclerotherapy. We, therefore, avoid the use of foam in patients with migraine headaches, unless there are no other good options. In that case, we have the patient formally studied for PFO by a cardiologist. If PFO is ruled out, it is safe to use foam. In over 15 years of using foam sclerosants, we have triggered a migraine in only one patient. Recently introduced commercially produced “microfoam” called Varithena® is approved for treatment of superficial veins and it is claimed to be safer for treating larger veins. It utilizes a gas mixture of carbon dioxide and oxygen, with no “low soluble” nitrogen. The liquid component is polidocanol. Microfoam overcomes some of the shortcomings of foam prepared at the time of use, producing a safer and more stable alternative, especially when using larger volumes.